The WA series CCTV camera washer is designed and manufactured in the UK. It is available with a number of options to accommodate nearly every type of security installation. The WA series CCTV washer forms a critical part of any CCTV installation where there is dirt or atmospheric contaminates. Without the use of a washer (and wiper) picture degradation starts from the very first day on installation. The WA series CCTV washer have been designed with ease of installation and minimal service overhead in mind. The plug-in connectors allows the water bottle to be removed from the cradle and taken elsewhere for filling up. This is not just convenient but where the washer is installed near other electrical equipment an absolute necessity. All of our WA series washers are compatible with the IndigoVision Interceptor dome. Simply connect the washer to the 24vac* power supply and connect the CONTROL input on the washer to the RELAY output on the camera and you are good to go. A special washer jet mounting bracket is available for the Interceptor dome. This optimises the position of the adjustable twin-jet water output for the Interceptor dome. For Hikvision domes that have a wiper and feature an alarm output using a WA series washer could not be easier. All you need is the twin-jet mount and then you are all set. Use the alarm output to connect directly to the control input on the washer PSU. You can activate the washer using that either from the Hikvision DVR or VMS. ITS Products Limited has developed a version of the WA10 washer specifically for use with the Panasonic AeroPTZ (WV-SUD638). The washer has been been adapted to simplify the physical and electrical integration between the dome and the washer. A copy of the manual for the washer will be available in the download section. Exclusively available from Panasonic throughout Europe please contact your local office for more details. The WA series washer integrates perfectly with the Predator domes from 360VisonTechnology. You will need to choose a 230/230vac version as the Predator PSU with washer output uses a mains voltage relay to turn on and off the washer unit. If you let us know that you are using a Predator dome we can supply a special washer jet mount too. The most common reason for this is when you are using the switching power method to turn the washer on or off. 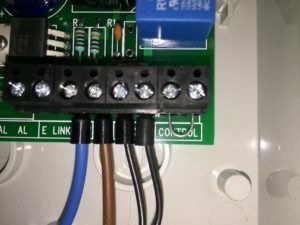 If you are sure you are getting power to the unit correctly (and other factors such as fuses have been ruled out) have you checked to see if you have bridged the CONTROL inputs on the washer PSU. In the image a loop of tinned copper wire has been used. These CONTROL connectors are only used to connect a device such as a telemetry receiver. For more information download the manual from the product information page here. We would always recommend that the washer control function is set to momentary, or at the very least timed. Setting it to latching can result in the operating forgetting it is on and running the bottle out of water. Although the float switch feature will prevent the pump from burning out it will mean that you need to go and refill it far more often than you had planned. The WA series washer units should be mounted below the camera or water jet output. If this is not possible then the water will drain out of the water reservoir after the pump has been activated. Its called siphoning. We can offer an anti-siphon device which requires connection to the WA series washer. Contact our sales department for details. 304 v 316 Stainless Steel? The standard WA series washers are manufactured from 304 grade stainless steel. This material is incredibly corrosion resistant in normal environments and will give years of service with no significant level of degradation. If you are mounting the WA series washer in an area that is considered highly environmentally corrosive then you can consider 316 grade stainless steel. This is more commonly known as marine grade stainless steel and if you want to learn a bit more you can find out here. Regardless of what grade of stainless steel you chose it can still discolour depending on the environmental conditions. Often customers can mistake a contaminant for rust when it is actually ferric particles that have landed on the stainless steel and discoloured. A simple rub with wire wool or even a cloth can often remove this. Can I use anti-freeze or screen wash? Yes. We would certainly recommend a suitably diluted screen wash or anti-freeze additive in the water reservoir. Allowing water to freeze in the water reservoir can cause the bottle to crack, just like on your car screen washer reservoir. Check the manufacturers recommendations for details of the dilution. Always ensure you label the water reservoir correctly to reflect the use of poisonous substance. How does a CCTV washer extend lens life? If a screen is dirty the camera/lens if working in auto-focus mode will try and near focus on specs of dirt. The camera will try and fight that as clearly you are trying to view further than a few centimetres. The tiny lens drive motors are not designed to keep working 24/7 and this will have an impact on their MTBF. Having a clean screen will prevent this. What warranty does the washer have? As standard all of our products have a 2-year warranty. This warranty is against manufacturing failure and has a couple of common-sense exclusions on the hose, the nozzle and the bottle. All warranties on a back-to-base basis. Can I get a CAD drawing? All our products are designed by us on Solidworks 3D CAD software. We can provide you with simple PDF line drawings (some available on the site already) or any number of other formats including DXF, DWG, eDrawing etc. Email sales@its-products.co.uk with your requirements and we will see how we can help. There is no strict routine maintenance that needs to be observed for the WA series washers. It is good practise to check the bottle for any algae build up, although this should be minimal if you are using a screen wash. You should also check that the hose is properly connected to the twin jet and the output spout.